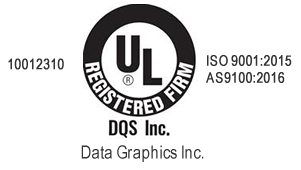 Industrial Printing Policies | Data Graphics Inc. Industrial Printing Policies | Data Graphics Inc.
Visa, MasterCard, American Express, Discover, a check in advance, COD, or 1%10, Net 30 terms – with approved credit application only. 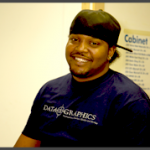 Data Graphics can send you an e-mail for each and every shipment, or you can call your Sales Engineer for a tracking number on a recently shipped item. Standard lead time is about 7-9 business days after we receive the signed art proof. We typically do not charge expedite fees. However, premium service is available upon request. We have no minimum order quantity requirements. Our minimum production run is $250 per part number, excluding set-up fees/tooling. Our sales representatives can quote any quantity. If ordering a small quantity that would fall well below minimum production-run dollar amount, our sales representative will let you know the maximum number of labels you can receive for our minimum dollar amount. Because Data Graphics has no quantity minimum, we can quote you a price for a prototype run. A fax machine can distort sizes, so the fax we send you may not match the dimensions on your proof. We list the exact dimensions on the bottom of the photo proof along with applicable tolerances. These are the dimensions your parts will be manufactured to, +/- .010. Files can be sent via e-mail. If they are too large (more than 10MB), we can send you our FTP username and password. Please work with your inside Sales Engineer if you have any questions. For file formats, please refer to our artwork requirements. The price of custom labels is driven very much by quantity, amount of colors on the label and the material you select. The higher quantity of labels you purchase, the better the price on each unit. The set-up time of a label is the same regardless of how many labels someone orders. Therefore, this is a fixed cost and will not change. Once you get the ball rolling, ordering more labels is much more cost effective. Colors on a label also affect the price due to the number of color matches that need to be done. Material is the final factor.